I have received a couple of messages from the LORD for this year 2018. They will be shared together in this post because they both deal with events that are getting ready to take place in the near future. The first one came on April 20 while I was sitting in my yard watching the leaves in the trees swaying as the wind was blowing upon them. As I kept looking, it seemed to me as if the branches and leaves were clapping and praising the LORD OF HOSTS. I am sure it always happens, however I had not noticed it until I took the time to be quiet and still to experience the presence of God. Isaiah 55:12 For you shall go out with joy, and be led forth with peace: the mountains and the hills shall break forth before you into singing, and all the trees of the field shall clap their hands. The Holy Spirit will not overshadow you until you become quiet and still so that He can come and overshadow with His presence. He will not come until you have prepared the atmosphere in solitude. We live such busy lives, surounded by noise and electronic gadgets without which most people could not live without. We need to steal away sometimes and be alone with God so that He can refresh us. He will not do it if our life are out of order. You need to repent first. Repentance and conversion come from you; refreshing and restoration come from the LORD. Acts 3:19 "Repent therefore, and be converted, that your sins may be blotted out, when the times of refreshing shall come from the presence of the Lord." 'The Holy Spirit has shown me that this year 2018 will be a year of breakthrough for many who have been going through a wilderness experience for some time. This will be a very productive year for those who have remained faithful in spite of great opposition by the forces of darkness. Proverbs 15:3 "The eyes of the LORD are in every place, beholding the evil and the good." Psalms 34:13-16 "Keep your tongue from evil, and your lips from speaking deceit. Depart from evil, and do good; seek peace, and pursue it. The eyes of the LORD are upon the righteous, and his ears are open unto their cry. The face of the LORD is against them that do evil, to cut off the remembrance of them from the earth." Proverbs 5:21 "For the ways of man are before the eyes of the LORD, and he ponders all his paths. The second message was received on May 5. I was sitting out my home praying, watching the heavens and the splendor of its beauty. There were may birds singing, the wind was blowing softly when suddenly the burden of the LORD came upon me and I started to travail in the spirit. This burden stayed with me throughout the day and that night as I was laying in bed praying it came upon me again. I started to sense how exceedingly grieved the Spirit of the LORD is concerning His creation, and how it is being trampled, defiled and desecrated by ungodly wicked people, even some who call themselves Christians. Psalms 106:36-40 "And they served their idols: which were a snare unto them. Yea, they sacrificed their sons and their daughters unto demons, And shed innocent blood, even the blood of their sons and of their daughters, whom they sacrificed unto the idols of Canaan: and the land was polluted with blood. Thus were they defiled with their own works, and played the harlot with their own deeds. Therefore was the wrath of the LORD kindled against his people, so much that he abhorred his own inheritance." Jeremiah 16:17-18 "For my eyes are upon all their ways: they are not hid from my face, neither is their iniquity hid from my eyes. And first I will recompense their iniquity and their sin double; because they have defiled my land, they have filled my inheritance with the carcases of their detestable and abominable idols." This went on for a while, until the burden lifted. Then He asked me to open my Bible that He was going to talk to me through His Word. As I continued to pray lying in my bed before His Presence, I opened my Bible and began to read the Word of the LORD. Psalms 19:7-8 'The law of the LORD is perfect, converting the soul: the testimony of the LORD is sure, making wise the simple. 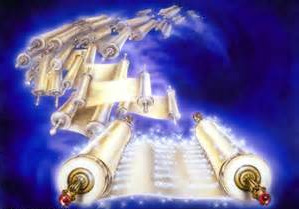 The statutes of the LORD are right, rejoicing the heart: the commandment of the LORD is pure, enlightening the eyes." Joel 2:28-29 "And it shall come to pass afterward, that I will pour out my spirit upon all flesh; and your sons and your daughters shall prophesy, your old men shall dream dreams, your young men shall see visions: And also upon the servants and upon the handmaids in those days will I pour out my spirit." Joel 2:25-27 "And I will restore to you the years that the swarming locust has eaten, the crawling locust, and the consuming locust, and the cutting locust, my great army which I sent among you. And you shall eat in plenty, and be satisfied, and praise the name of the LORD your God, who has dealt wondrously with you: and my people shall never be ashamed. And you shall know that I am in the midst of Israel, and that I am the LORD your God, and none else: and my people shall never be ashamed." Psalms 19:9-10 "The fear of the LORD is clean, enduring forever: the judgments of the LORD are true and righteous altogether. More to be desired are they than gold, yea, than much fine gold: sweeter also than honey and the honeycomb." Joel 2:30-32 "And I will show wonders in the heavens and in the earth, blood, and fire, and pillars of smoke. The sun shall be turned into darkness, and the moon into blood, before the great and the terrible day of the LORD comes. And it shall come to pass, that whosoever shall call on the name of the LORD shall be delivered: for in mount Zion and in Jerusalem shall be deliverance, as the LORD has said, and in the remnant whom the LORD shall call." Get ready for what is about to take place. Keep your eyes on Jesus, and your heart free from the cares of this world. It is going to be glorious!